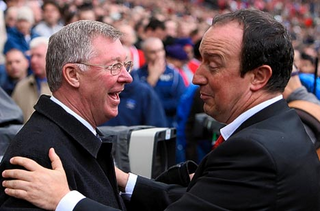 Rafa Benitez has yet to beat the United boss since he arrived at Anfield, in the main due to misfortune. Liverpool will be hoping to turn the tables this weekend and both managers have been speaking in their respective pre-match press conferences. “You can’t avoid the intensity of it, the tension, the atmosphere,” he said. “The Liverpool game brings out a certain anticipation in players. It’s a game players all want to play in, so we’ll have some disappointed players tomorrow who are not playing. “Liverpool coming to our ground, a derby game, is always a difficult game. They are very solid defensively and they are talking about the Steven Gerrard-Fernando Torres partnership. We know about Steven Gerrard, of course, he has played many of these derby games. United have been steered this season by 33 goals so far Cristiano Ronaldo and Ferguson had some words about the Portugese player. “The boy’s form obviously demands your attention and you are giving him plenty of that,” Ferguson said. “I can’t do anything about that, it’s not my department. He wouldn’t be getting it if he wasn’t doing it. “It is a crucial time. If we win, we will be closer, then we can continue trying to win every game and get closer and closer. It will be really difficult to get closer to them, so we need to think about fourth position and the fight against Everton. “I think we have enough confidence now to keep winning, but it will be a big test against United because they have a lot of good players. We have confidence, we are playing well and if we keep playing at the same level we don’t need to fear anyone. [When asked if Ronaldo was the key player to stop] “Maybe stopping Torres! No, they have a lot of good players, so it will be difficult if you just think about Ronaldo. We have to think about all of them. “I think he’s in form but Torres is too. The other day Ferguson was talking about referees having to protect Ronaldo. I think it’s important to protect players like Torres, Ronaldo and all players with quality. Torres – Kick United’ asses.